I don’t rave about it very often anymore, but you may have gathered that Led Zeppelin is where this site gets its name. My uncle Jim gave me their boxed set on cassette in 1990 and the band quickly turned into my teenage obsession. After the death of their drummer, John Bonham (in 1980, three days before I was born), Led Zeppelin disbanded and its remaining members have continued to tour in various groups ever since. Until this month, I hadn’t had the opportunity to see any of these acts live. I haven’t read up much on the Sensational Space Shifters, but I enjoyed the Spanish guitar (in Babe, I’m Gonna Leave You) and the eclectic sounds and singing from Gambian Juldeh Camara (particularly in the West African-sounding rendition of “Black Dog”; and I’d really like to know what he was singing in his native tongue). Plant wafted incense from the stage into the crowd, and even as the rain started falling during “What Is and What Should Never Be,” I was definitely feeling the love. 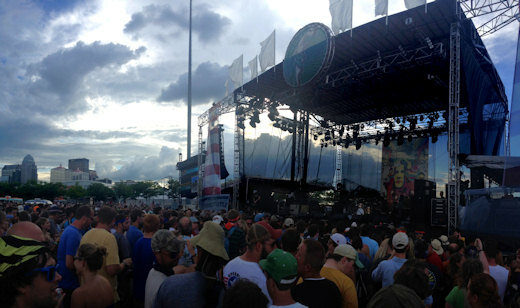 Mother Nature may have cut their set 30 minutes short at Forecastle, but that’s all part of summer festival fun, right? Plant and his band are moving up the East Coast for the final week of their tour before they hop over the pond, back to the UK. 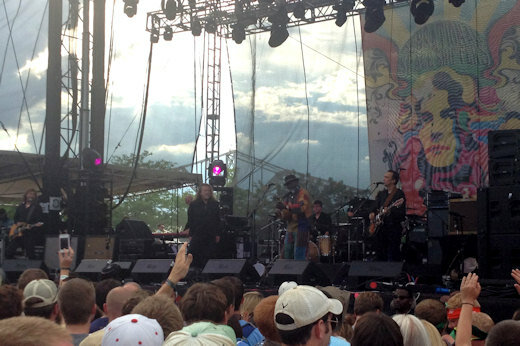 More of my Forecastle photos on Flickr.